Iron Man is back, this time in his own movie – but in an unusual move for an action flick, the events of his previous film (the record-setting “The Avengers”) are not only mentioned but having negative consequences for his mental health. He doesn’t have time to sit around and deal with his issues, though – there’s a new villain on the scene, and he makes things personal for Tony very, very quickly. If you somehow haven’t seen any of the previous Iron Man films, or “The Avengers,” you are likely doing yourself a disservice. Even non-comic-book-fan folks who enjoy big action movies generally love them (with the possible exception of “Iron Man 2,” which was rather lackluster in the writing department). However, you can probably enjoy “Iron Man 3” without having seen the previous films as long as you’re aware that they exist and you’re going in without full knowledge of the background. The important thing to know is that Tony Stark (Robert Downey Jr.), once a delightedly-immoral arms dealer and now a superhero and pioneer in green energy tech, nearly died in the last film. As usual, Downey plays the part perfectly, giving us the slightly manic glint of a man who’s sleeping too little and trying to pretend it’s not because he’s terrified of what he’ll see when he closes his eyes. It’s refreshing to see a superhero movie deal with the actual psychological consequences of someone who is, for all intents and purposes, just a regular human, having far from regular experiences. Tony’s issues, and his failure to deal with them in a healthy way, are putting a strain on his relationship with Pepper (Gwyneth Paltrow). Paltrow has been one of the best things about this series since the beginning, and she nails her performance here. Pepper loves Tony, but part of what makes their relationship work is her refusal to put up with his nonsense – and that has the potential for serious consequences. Meanwhile, a terrorist calling himself The Mandarin (Ben Kingsley) is taking credit for a series of mysterious explosions around the US – none of which seem to have actual bomb fragments involved at the scene. When it gets personal – and when you’re dealing with a narcissist like Tony, everything is personal – Tony finds himself on the run, presumed dead, and with a nonfunctioning prototype suit of armor rather than one of his near-omnipotent awesome suits. He winds up in the middle of nowhere, teaming up with a kid (Ty Simpkins) who’s passionate about engineering and helps Tony fix up the broken suit. 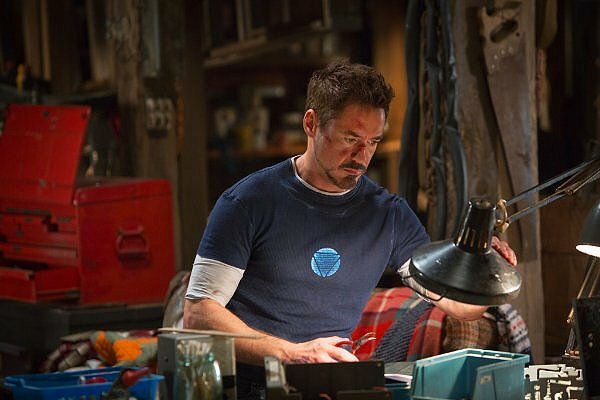 It’s pretty awesome to see this Tony Stark back in action, the one who built the first suit in a cave with a box of scraps. He winds up facing the baddies using improvised tech which looks bizarre but actually (mostly) works. It’s also awesome to see Ben Kingsley really flexing his acting muscles here. Without giving too much away, let me just say that his performance in the second half of the film is a thing to delight even casual fans of his acting. Lastly, it wouldn’t be an Iron Man movie without at least a few scenes of Tony and his suit blowing things up. While everything leading up to it is generally low on action, the big finale more than makes up for it, and it’s completely worth the wait. Rhodey (Don Cheadle), Tony, and the suits kick a lot of baddie behind, the special effects are glorious, and there are enough explosions to satisfy all but the most ardent pyrotechnic fans.